Located in southern Peru, Cusco is the tourist capital of the South American country, thanks mostly to its rich heritage and stunning ancient landmarks. International visitors planning a trip to Cusco should fly to Lima and catch a connecting flight, or train, to the city. Cusco’s rich Inca heritage is on view across the city. Many of the buildings, including those constructed during colonial times, were built on the foundations of Inca structures. Stone walls constructed during Pre-Colombian times can still be seen today. In fact, many of these faired a lot better than their more modern counterparts when an earthquake struck in 1650. As with its Inca heritage, the effect Spanish conquistadors had on the city can still be seen clearly today. Both La Cathedral and the Iglesia de la Compania feature European architecture and décor. Each of these religious sites portrays a very Catholic feel, although the more keen-eyed visitor will notice more than a few local nuances on display in the paintings that adorn the walls. The city is home to a host of museums dedicated to the history of the region. The Museo de Arte Religioso, which is housed in a former palace, displays religious paintings and other works from the 17th and 18th centuries. The Museo de Arte Precolombino houses 450 relics dating back to Inca times, and while this may not be the biggest collection of its kind, it’s certainly one of the best. Similarly, the Museo Inka is a treasure trove of Inca textiles, ceramics, jewelry, precious metals, and mummies. Other popular places of interest in the city include the Santa Catalina convent, the San Blas District, and Plaza de Armas. The latter is the perfect place to spend a relaxing afternoon. The real beauty of Cusco as a tourist destination lies in the excursions that can be enjoyed beyond the city streets. Trips to the likes of Tambomachay, Salapunco, Quenko and Tipon all offer the chance to see magnificent Inca ruins, as well as the region’s stunning and varied landscapes. Of course, the most famous of all of these stunning historic sites, and one attraction that should be on any Cusco trip plan is Machu Picchu. Rediscovered by Hiram Bingham III in 1911, Machu Picchu (or ‘Old Mountain’) is a mountaintop Inca settlement that went untouched by the Spanish conquest. Its original purpose remains unknown but today it provides one of the World’s truly stunning attractions to visit. Fly to Cuzco on 11/30 by plane ($172pp round trip with starperu.com). Day 1: 11/30: Arrive in Cuzco (10AM or later) and settle in. Day 2: 12/01: Visit Cuzco! Day 1: 12/07: Relax in Cuzco. Next day comes the plane trip to Lima. Cusco attracts thousands of travellers who come to experience an age-old culture and to delve into its tragic and noble past. It is the perfect base for optional explorations of the city and area as well as a range of outdoor activities. We spend the next few days relaxing and exploring this fascinating city, while taking time to acclimatize to the higher altitude before our trek. 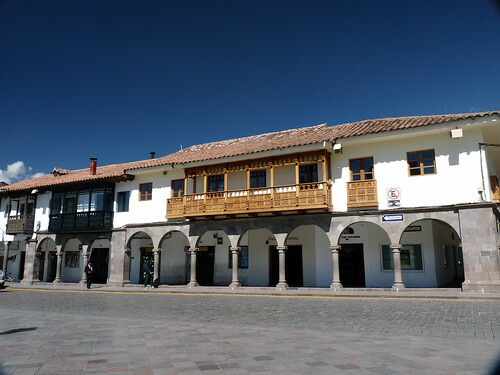 Cusco is the hub of the South American travel network. The city attracts thousands of travellers who come not just to visit a unique destination but also to experience an age-old culture very different from their 20th century way of life; one could easily spend a week just in and around the area. Cusco is the continent’s oldest continuously inhabited city. Inca-built stone walls line most of the central streets and you don't have to go far to see other Inca ruins. It is a city steeped in history, tradition and legend. Cusco’s numerous colonial churches are one of the most common sights. The Cathedral was started in 1559 and took 100 years to build. It is also one of the city’s greatest repositories of colonial art. Immediately in front of the entrance is a vault containing the remains of the famous Inca historian, Garcilaso de la Vega. Also worth visiting are the churches of La Compañía, La Merced and San Francisco. the magnificence of the original structure. pair of shoes, arm yourself with a city map and set off to explore! Enroute to Ollantaytambo, travel through the stunning Sacred Valley of the Incas. Opt to take a tour of the Sacred Valley and visit a Planeterra-supported women's weaving co-op. The impressive Pisac ruins,the colourful artisan market (market days only) and the large ruin site of Ollantaytambo that lies adjacent to the town of the same name where we catch our breath and prepare for the hike ahead. viable economic alternative for women by creating a weaving cooperative to sell traditional textiles to travellers. Donations by travelers have helped build a community centre supplied with looms and sewing machines for the women to use to expand their production. This project allows the women of the Ccaccaccollo community to maintain their cultural heritage and benefit from the tourism industry. Trail you can take a Sacred Valley tour which includes not only Ollantaytambo but also the ruin site of Pisac. Andina is now a successful business that produces biodegradable soaps, detergents, and natural products for use by travelers, porters, and cooks on the Inca Trail. G Adventures is their biggest client, purchasing hundreds of their products per month for Inca Trail travellers!